According to data from EIA’s most recent Electric Power Monthly, since November 2016, more than 75% of Maine’s electricity generation has come from renewable sources, including hydroelectricity. Natural gas accounted for, on average, 19% of electric generation during the same time period, compared to ten years ago, when natural gas accounted for, on average, almost 50% of Maine’s generation. Between 2007 and 2017, Maine was the only state—of the 11 states that used natural gas as the primary fuel source for power generation—where natural gas no longer had the largest share. Biomass temporarily surpassed natural gas in November 2016 and December 2016 as the predominant fuel source of Maine’s electricity in those months, generating 16% and 21%, respectively. Since 2017, hydroelectricity has remained Maine’s largest electricity-generating source, with the exception of October 2017 when wind was predominant. Hydroelectricity has averaged 276,281 megawatthours (MWh) per month, or 29% of total electricity generation. Net electricity generation in Maine has been consistently declining since 2010. In 2017, the net electricity generated in the state was 11.3 gigawatt hours (GWh), compared to 17.0 GWh generated in 2010. The largest decline was in electricity generated by natural gas-fired power plants, which decreased from 8.4 GWh in 2010 to 2.2 GWh in 2017. The share of natural gas-fired generation in total generation has declined from 49% in 2010 to 20% in 2017 and to 14% so far this year. Maine’s Renewable Portfolio Standards (RPS) require electricity providers to fuel 30% of their electricity generation with renewable resources. 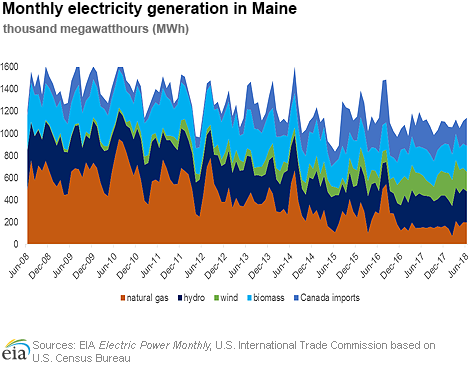 In addition to policy initiatives, electricity imports from Canada—notably from Quebec—have been contributing an increasingly larger share to Maine’s total generation, displacing natural gas-fired generation as the primary source. Since 2012, electricity imports from Canada have more than tripled, increasing from 0.8 GWh in 2012 to 2.7 GWh in 2017. Even though current demand is being met with a combination of renewables, natural gas, and Canadian imports, additional natural gas infrastructure is under consideration to maintain reliability in Maine and New England. Natural gas deliveries have grown in the residential and commercial sectors and declined in power and industrial sectors. Residential and commercial deliveries have increased by 128% and 57%, respectively, since 2010. Industrial and power sector deliveries have decreased by 38% and 45%, respectively, since 2010. The Federal Energy Regulatory Commission (FERC) is conducting an environmental assessment for TransCanada's Portland Xpress Project. The proposed expansion project would add 0.18 billion cubic feet per day (Bcf/d) of capacity into Maine from Canada. Current pipeline capacity into Maine is estimated at 1.7 Bcf/d. Natural gas spot price movements were mixed this report week (Wednesday, September 19 to Wednesday, September 26). 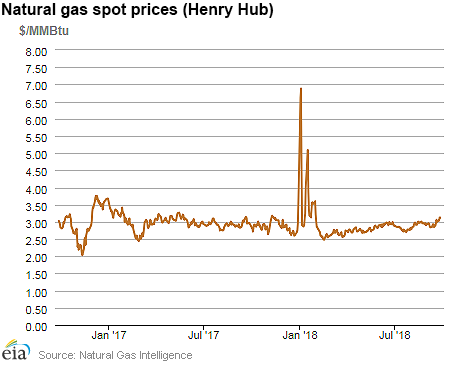 Henry Hub spot prices rose from $3.06 per million British thermal units (MMBtu) last Wednesday to $3.13/MMBtu yesterday. At the New York Mercantile Exchange (Nymex), the October 2018 contract expired yesterday at $3.021/MMBtu. The November 2018 contract price increased to $2.980/MMBtu, up 10¢ Wednesday to Wednesday. Net injections to working gas totaled 46 billion cubic feet (Bcf) for the week ending September 21. 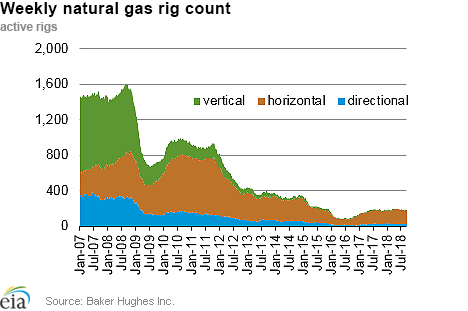 Working natural gas stocks are 2,768 Bcf, which is 20% lower than the year-ago level and 18% lower than the five-year (2013–17) average for this week. 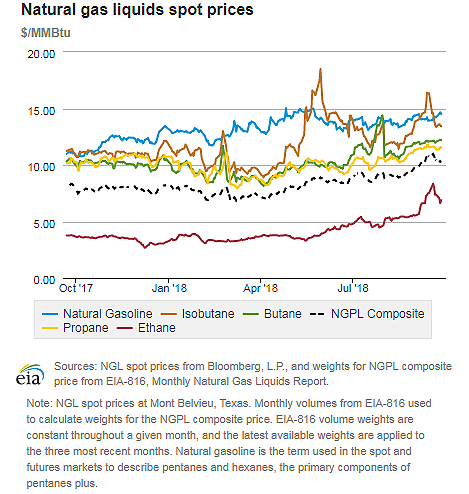 The natural gas plant liquids composite price at Mont Belvieu, Texas, fell by 48¢, averaging $10.37/MMBtu for the week ending September 26. The price of ethane and isobutane fell by 11%. The price of propane fell by 1%. The price of natural gasoline rose by 3%. The price of butane remained flat week over week. According to Baker Hughes, for the week ending Tuesday, September 18, the natural gas rig count remained flat at 186. The number of oil-directed rigs fell by 1 to 866. The total rig count decreased by 2, and it now stands at 1,053. With cooler weather this week, the national benchmark weekly average spot price increases. This report week (Wednesday, September 19 to Wednesday, September 26), the average Henry Hub spot price for the trading week rose 12¢ from $2.94/MMBtu for the week ending last Wednesday to $3.064/MMBtu for the week ending yesterday. Temperatures were cooler this week compared to last week, with average temperatures this week falling below 65 degrees Fahrenheit (°F) across the northern Lower 48 states, leading to increased residential and commercial consumption for space heating. These cooler temperatures extended as far south as parts of Texas and New Mexico. Wednesday-over-Wednesday spot prices decrease at key Midwest trading hub. At the Chicago Citygate, prices decreased 11¢ from $3.00/MMBtu last Wednesday to $2.89/MMBtu yesterday, as northbound flows on Kinder Morgan’s Natural Gas Pipeline of America rose to pre-force majeure event levels, according to data from PointLogic Energy. The force majeure events, which occurred near the Permian Basin in Texas, affected northbound flows on pipeline Segment 8 and Segment 11 and, ultimately, deliveries from the Permian Basin into Illinois. California price movements are mixed. Prices at SoCal Citygate decreased 88¢ from $4.58/MMBtu last Wednesday to $3.70/MMBtu yesterday, as Southern California Gas Company’s (SoCalGas) natural gas inventories are near the maximum allowable total capacity of 83 Bcf. According to SoCalGas’s electronic bulletin board system maintenance logs, the Aliso Canyon field reached its maximum capacity of 34 Bcf on Monday, and the company expects the Honor Rancho field to reach capacity—about 27 Bcf—next Monday. Prices for Thursday delivery at PG&E Citygate in Northern California rose 19¢, up from $3.09/MMBtu last Wednesday to $3.28/MMBtu yesterday. Temperatures today are expected to be warmer compared to temperatures last week. Northeast price movements are mixed. At the Algonquin Citygate, which serves Boston-area consumers, prices went up 32¢ from $2.91/MMBtu last Wednesday to $3.23/MMBtu yesterday. At the Transcontinental Pipeline Zone 6 trading point for New York City, prices decreased 16¢ from $3.01/MMBtu last Wednesday to $2.85/MMBtu yesterday. Appalachian prices decrease. Tennessee Zone 4 Marcellus spot prices decreased 85¢ from $2.55/MMBtu last Wednesday to $1.70/MMBtu yesterday. Prices at Dominion South in southwest Pennsylvania fell 41¢ from $2.57/MMBtu last Wednesday to $2.16/MMBtu yesterday. Discount at key Permian Basin trading hub narrows. Prices at the Waha Hub in West Texas, which is located near Permian Basin production activities, averaged $0.61/MMBtu last Wednesday, $2.45 lower than Henry Hub prices. Yesterday, prices at the Waha Hub averaged $1.36/MMBtu, $1.77 lower than Henry Hub prices. Flows out of the Permian Basin began to rise this week after a decrease late last report week following a force majeure on September 17, 2018 and a force majeure on September 18, 2018, both on Kinder Morgan’s Natural Gas Pipeline of America. Nymex futures increase. At the Nymex, the October 2018 contract expired yesterday at $3.021/MMBtu, up 11¢ from last Wednesday. The November 2018 contract increased to $2.980/MMBtu, up 10¢ from last Wednesday to yesterday. The price of the 12-month strip averaging November 2018 through October 2019 futures contracts climbed 6¢ to $2.813/MMBtu. Overall supply is flat with production increases offsetting import declines. 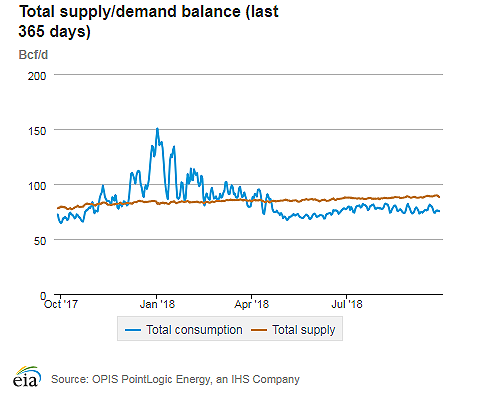 According to data from PointLogic Energy, the average total supply of natural gas remained the same as in the previous report week, averaging 89.2 Bcf/d. 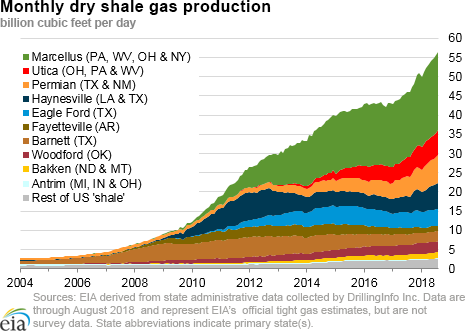 Dry natural gas production grew by 1% compared with the previous report week, averaging 84.4 Bcf/d. Average net imports from Canada decreased by 2% from last week. Overall demand decreases. Total U.S. consumption of natural gas fell by 2% compared with the previous report week, according to data from PointLogic Energy. Natural gas consumed for power generation declined by 10% week over week with cooler weather moving in this week. Industrial sector consumption increased by 2% week over week, while combined residential and commercial sector consumption increased by 22%. Natural gas exports to Mexico decreased 2%. U.S. LNG exports are flat week over week. Five LNG vessels (four from the Sabine Pass liquefaction terminal and one from Cove Point) with a combined LNG-carrying capacity of 18.4 Bcf departed the United States from September 20 through September 26. Two more tankers (combined LNG-carrying capacity of 7.1 Bcf) were loading on Wednesday at the Sabine Pass terminal. Cove Point LNG facility has started a seasonal scheduled maintenance. The last vessel before the start of maintenance departed the facility on September 20. Net injection levels are lower than the five-year average. Net injections into storage totaled 46 Bcf for the week ending September 21, compared with the five-year (2013–17) average net injections of 81 Bcf and last year's net injections of 64 Bcf during the same week. Working gas stocks totaled 2,768 Bcf, which is 621 Bcf lower than the five-year average and 690 Bcf lower than last year at this time. Working gas stocks’ deficit to the five-year range increases. The average rate of net injections into storage is 16% lower than the five-year average so far in the 2018 refill season, which covers April through October. If the rate of injections into working gas matched the five-year average of 10.7 Bcf/d for the remainder of the refill season, total inventories would be 3,194 Bcf on October 31, which is 621 Bcf lower than the five-year average of 3,815 Bcf. In the Lower 48 states, total working gas stocks are currently 252 Bcf lower than the five-year minimum, and every storage region is currently near or lower than the bottom of the five-year range. As of this report week, the Midwest region is 87 Bcf (10%) lower than the five-year minimum, and the South Central region―including both salt and non-salt facilities―is 77 Bcf (27%) lower than the five-year minimum. The average January 2019 futures contract price is trading at a lower premium to the average spot price than last year at this time. Price differences between the spot price and the futures price at the Nymex indicate limited economic incentives for injections into working gas. 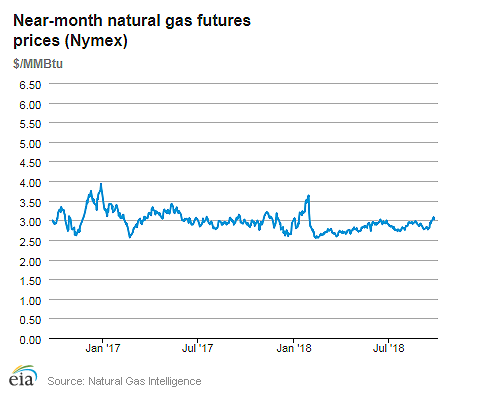 During the most recent storage week, the average natural gas spot price at the Henry Hub averaged $2.96/MMBtu, and the Nymex futures price of natural gas for delivery in January 2019 averaged $3.02/MMBtu, 6¢/MMBtu higher than the spot price. A year ago, the January contract was 31¢/MMBtu higher than the spot price. Reported net injections into storage are lower than the range of analysts’ expectations. According to The Desk survey of natural gas analysts, estimates of the weekly net change from working natural gas storage ranged from net injections of 49 Bcf to 79 Bcf, with a median estimate of 61 Bcf. At the 10:30 a.m. release of the Weekly Natural Gas Storage Report, the price of the Nymex futures contract for November delivery at the Henry Hub rose by 2¢/MMBtu to $3.04/MMBtu, with 886 trades executed. The price increased slightly in subsequent trading, to about $3.06/MMBtu. Temperatures were significantly warmer than normal for the storage week. Temperatures in the Middle Atlantic Census division averaged 71°F, 8°F higher than the normal and 1°F higher than last year at this time. Temperatures were 1°F higher than those reported for the previous week.